Mar. 15, 2017 update: For the first time in the over 4 years since the paperback version of this book was first published, it is now finally available for sale at Amazon Japan. Yay! Because of the minimum production cost for printing a ~100-page color paperback, though, I was unable to reduce its list price, but in celebration of it finally making it to Japan, I decided to permanently reduce the price of the eBook version to just $2.99. The View from the Top of Japan book is hot off the press. I've been toying w/ the idea for at least 9 years, but in early Sept. 2012 I finally got a (round tuit). Japan has some of the most spectacular peaks anywhere on the planet and so it’s only natural that visitors to the country are immediately drawn to peaks like the iconic Mt. Fuji, the most visited mountain in the world; the many beautiful peaks of the Northern, Central, & Southern Japan Alps; as well as the 100 Famous Japanese Mountains spread throughout the Japanese archipelago. Being a lifelong climber, the attraction for Japan’s breathtaking mountains was immediate for me, and so within only 4 short months of arriving in Japan a quarter-century ago, I was standing atop Fuji-san, the nation’s highest peak. 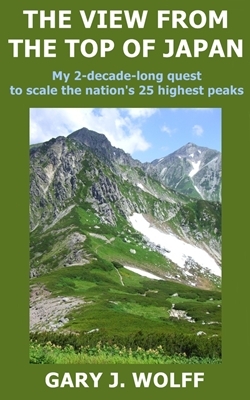 After becoming firmly hooked on the exhilarating 360-degree panoramas afforded by Japan’s alpine country, over the course of the next 2 decades I managed to climb all of the 29 highest mountains in Japan and 38 of the tallest 50. 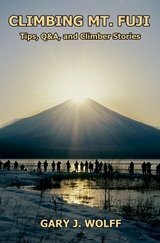 To the greatest extent possible, in this book I've tried to share intimate details of my love affair with Japan’s highest mountains including pics, trail descriptions, and other useful info based upon my 2-decade-long climbing experience in Japan. Not a hiking guide per se, The View from the Top of Japan will nonetheless whet your appetite to the point that you’ll want to hit the Japanese mountain trails immediately! Order your The View from the Top of Japan Amazon Kindle eBook version here. 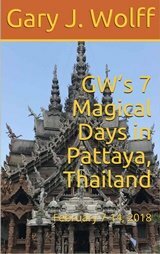 Order your Amazon Japan eBook version here. Order your The View from the Top of Japan Amazon color paperback version here. 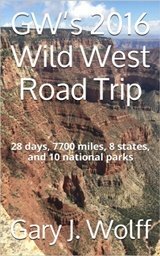 My new mountain climbing eBook is also available in 9 different formats from Smashwords, the world's largest distributor of indie eBooks. Smashwords distributes books to most of the major retailers, including the Apple iBookstore, Barnes & Noble, Rakuten Kobo, Oyster, and Scribd & offers a catalog of over 100,000 vetted, well-formatted eBooks from over 45,000 authors and publishers. The eBooks on Smashwords can be read online using their online readers, or they can be downloaded to other e-reading devices such as the iPhone, iPad, iPod Touch, Amazon Kindle, Sony Reader, Barnes & Noble Nook, Kobo, or most e-reading apps including Stanza, Aldiko, & Adobe Digital Editions. Smashwords also offers generous sampling options so readers can try before they buy. Read online or download instantly to your e-reading device in any of the 9 different formats. Order your The View from the Top of Japan Smashwords eBook version here. Order your The View from the Top of Japan Apple iBook version here. 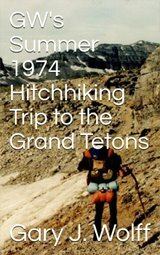 "Given my temporary hiatus from all things mountain, it's been great to live vicariously through your accounts. And to have the honor of being quoted, too! I especially liked the Happonba-no-koru section - it's not often that you see photos from that route. They made me question (and not for the first time) what on earth I was doing up there in winter that time...."
"I just wanted to let you know that I have been thoroughly enjoying your book. 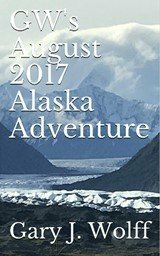 I particularly like your musings about all that you encounter along the way: those that you climb with, those that you meet along the way, unique views and scenery, the conditions of facilities, and particularly the way you cleverly weave Coca-Cola Zero into the stories. I commend you for the great effort you have made to compile all this information into a handy resource. Writing a book is a challenge that many people contemplate, but you deserve special praise for, first, accomplishing something worthy of a book, and second, demonstrating the perseverance needed over the years to document, compile, organize, and construct a work that others can make use of. I still haven't finished, but it has been a delight so far." "That's awesome - Congratulations, Gary! I now own it!!! Going to print it in colour, bind it, and put it on the coffee table. :)"
"REALLY enjoying your book, Gary. I just downloaded it today, and I've just now finished the Mt. Fuji chapter. Thank you for sharing your passion for mountain climbing. This is going to be a very special read!" "Great, Gary. Now it looks like you will be climbing an even steeper mountain — publishing. Good luck. Bought it and looking forward to it on my iPad." "Great stuff, Gary, congrats. 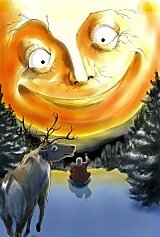 I just bought the Kindle version." "It starts off very good, Gary: 'Let's be frank....' That's easy for me. I downloaded it to my laptop." "Fantastic, Gary! Congrats....let me grab one and help U to sell it out....Smile!" "For you climbers out there. Gary has been doing this for years, highly recommended!" "Wow. this is ALL so impressive. 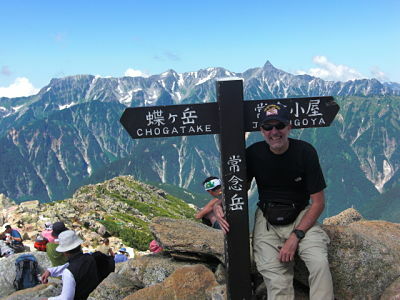 Not only a really great Texan, but he managed to scale all of Japan's 25 highest peaks. Well done, Gary!!!" "That's absolutely awesome. I am envious. Great job!!" "Congratulations, Gary! On the climbs AND the book!" "Congratulations, Gary! I don’t have i-gadgets. But when I have one, I will buy one. :) I like the subtitle." "Go for it, Gary! I'll climb vicariously through you." "This is my cousin Gary J. Wolff. I can't wait to read his book!! I'm sure it will do well!!!" "Hope many people will buy it, Gary!!! We are living in modern times with hopefully enough modern people buying your book. Interesting topic, I think." "Congratulations! That's quite an accomplishment." "So happy for you! Way to go!" Gary Joe Wolff is a Tokyo-based corporate communications consultant, university professor, and all-round nice guy. From Houston, Texas, USA, Gary earned a master's degree in civil engineering from the University of Texas and worked 12 years as a registered professional transportation engineer before moving to Tokyo in 1991. Since then he's been a specialist in intercultural corporate training for Japanese engineers & managers in preparation for their overseas assignments, and has taught at over 80 different companies, schools, and agencies. Also, for the past 16 years he has been a professor of Science English, Spoken English, and TOEFL/TOEIC Test preparatory classes for electrical engineering, computer science, & agriculture majors in the School of Science and Technology at one of Japan's oldest and most prestigious private universities. Since his Boy Scout days, Gary has been passionate about the great outdoors, and so in his free time, he tries to get up into the spectacular Japan Alps as often as possible. During the past 25 years, he has scaled all of the highest 29 peaks in Japan and 38 of the tallest 50. Although Gary has published a number of technical and academic papers during his engineering & teaching careers, The View from the Top of Japan is his 1st venture into book publishing. In 2013, he published his 2nd book on Japanese mountain climbing, Climbing Mt. Fuji: Tips, Q&A, and Climber Stories. He has found living in Japan to be a truly fascinating and rewarding cultural experience, and claims to have at least 3 or 4 more books on his mind. Stay tuned to Gary's latest updates from Japan on this site's blog page! Click here to order your The View from the Top of Japan Amazon Kindle eBook version. Click here to order your The View from the Top of Japan Amazon color paperback version. Click here to order your The View from the Top of Japan Smashwords eBook Version. 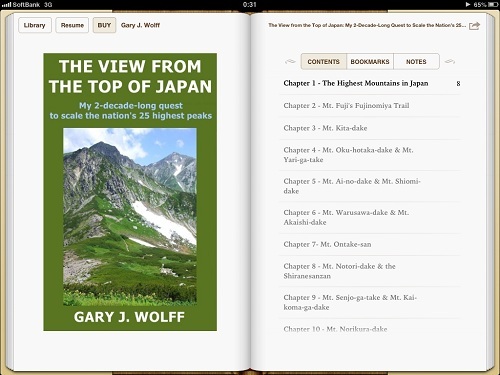 Click here to order your The View from the Top of Japan Apple iBook version.